One morning I had a spectacular fail as a home barista- my one and only regular customer dumped his lovingly hand crafted cup of high end Ethiopean Yirgacheffe straight down the drain. My husband hates - hates "blond" roasts as an abomination perpetuated by millennial roasters and I had conveniently forgotten all about it. I reckon you could not serve a blond roast to a civil war union soldier or an old time cowboy neither without them spitting out such weak brown stuffs. The current trend among specialty roasters is a lighter roast as dark roasting ruins the delicate aromatics of the original bean. When you add milk to a light roast- it just kills the flavor and the cup becomes dish rag water. I even contemplated re-roasting or giving the beans away. In the same way you would not defile a high end tea with cow juice, these blond roasts only show their best unadorned. It was the third time I drank this Ethiopian black that I totally understood the beauty of a blond roast. Since the citrus aromatics with the lingering sweetness is not what I traditionally consider "coffee", my prior expectations had ruined the experience. If someone had served me this brew as "tea" instead of coffee, I would have simply appreciated the cup without hangups. 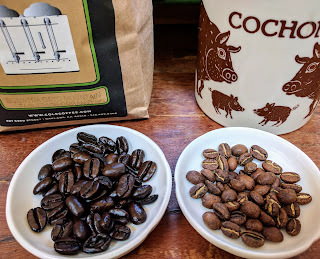 A local roaster "paid" my husband in suitably dark beans for a quickie metal job. 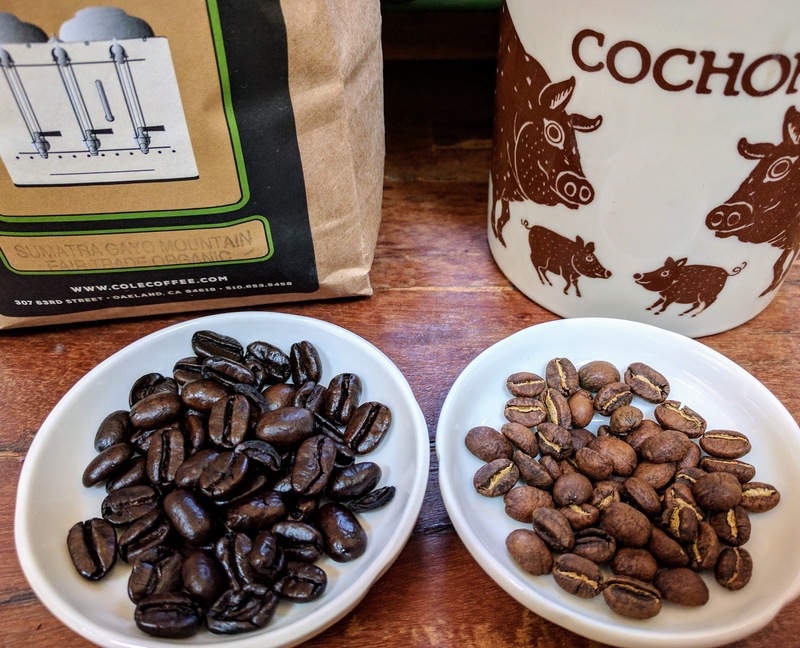 When I tasted the crowd pleasing rich full bodied nutty taste of this dark roasted Sumatra, I quickly realized fruity high noted complexity in the morning is not an appropriate start for a working man like my husband. Even I who only moves brain cells and a few fingers for a living prefer a dark cup in the morning- coffee or tea. I take my light roasted Ethiopians as an early afternoon treat and have given up convincing my man that floral and fruity aromatics belong in coffee. The Northern California weather gets nippier every morning demanding a dark vigorous brew. 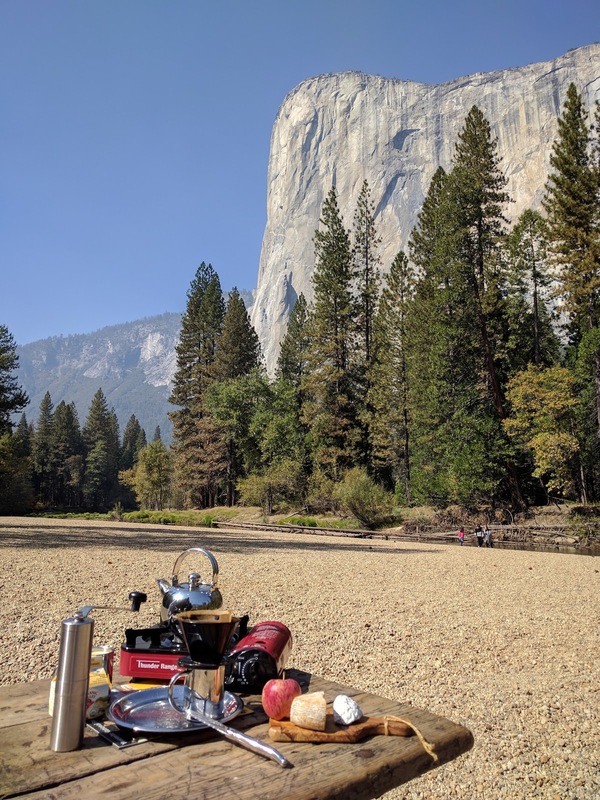 I have almost pried myself away from the seductions of coffee having my last hurrah at Yosemite. It was really the full cream and the airy microfoam on cappucino that sustained my addiction and so I must cut this inflammatory dairy cord and return back to tealand. Most importantly, sustaining such high dosages of caffeine in the blood stream has knocked down my deep sleep so I've amassed more than a few health reasons to cut the bean. I need a morning replacement that is dark, robust and NOT shu. (Well I shu on weekend mornings but work weekdays require something more mediated than the raw power of shu. Otherwise I get aggro and forget to be diplomatic during technical reviews.) My morning habit was hongcha for decades before this coffee detour and so I return to this familiar ritual of swishing hot water around dark leaves. 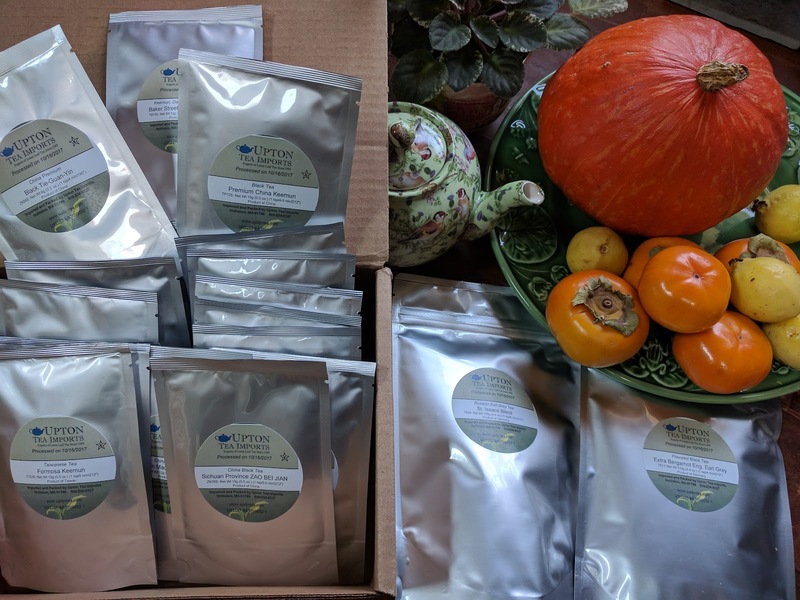 Where to procure decent quality hongcha (Indian, Chinese or otherwise) for daily use that is not too fancy but better than average? My last 2 orders of darjeelings direct from India was a slight flop as the first flushes were just too light/white and delicate for morning use. I use a pinch here and there in my afternoon blends but my kitchen cabinet is still overflowing with those sample bags. The solution to too much tea is of course more tea. 15 years ago, I remember my brother in law had gifted me some pretty good tins from Upton Tea. But since I had moved onto puerh and ordering direct from China, I never ordered from them. For the price less than my last parking ticket, I happily sent out for dozens of samples. My husband wryly commented, "There is something so deja vu about mylar bags stuffed in a box." 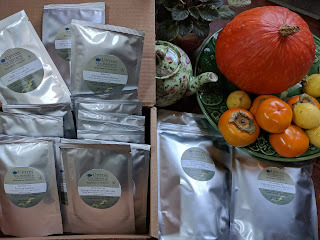 In reality, I could have held out the year comfortably with my home supply of Yunnan dianhong and Lapsang Souchong but I wanted to give myself some more encouragement to choose tea over coffee in the mornings. No disrespect to hongcha, but novelty in hongchas for the long time tea drinker does not stray far from a narrow band of familiarity. Nothing explosive or life changing, just pleasant diversions in more of the almost same. But that's exactly what I need in the mornings- one can't overstimulate the brain so early without consequences. Their Earl Greys are very respectable and I can see ordering from them regularly for hongcha. Truth be told, I thought I would be drinking my own aged shengs by now but I am to wait out a few more decades. In the meanwhile I quietly imbibe some juicy keemuns and assam blends without any second thoughts of coffee.